This frames is in mint condition and is an exhibit by an optician. The frame is shipped with the original case and the original demo lenses. This spectacle frame is a used article. In used articles despite careful workmanship can be visible traces. Material fatigue can cause fractures or cracks in used frames. Material fatigue and signs of wear are no defects. 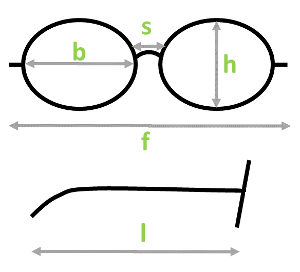 Unless otherwise specified, there are used lenses in the spectacle frame, which are not suitable for use. You can order and incorporate your glasses with you're correction either with us, our partners or the optician of your choice. Costs may be incurred for this service. Jede Brille wird von uns und unserem Team sorgfältig geprüft. Jede Brille wird von uns mit Liebe gründlich aufbereitet und gereinigt. So erstrahlen Sie wieder in neuem Glanz. Alle Bilder zeigen die originalen Brillen und sind in unserem eigenen Fotostudio aufgenommen. Erst wenn wir von der Qualität der gebrauchten Markenbrillen überzeugt sind, gelangt diese in den Verkauf. Sollte die Qualität nicht stimmen, die Fassung nicht passen oder dir nicht gefallen, kannst du jede unserer Brillen problemlos kostenlos an uns zurücksenden! Versprochen! Need glasses with you correction? Order this frame with your correction! Landario is a young startup company focused on buying and selling used high quality brand glasses from materials such as wood, horn, paper, carbon or titanium. Our team combines several years of experience in ophthalmic optics. Our vision is sustainable handling of used glasses. Often, used brand glasses are in good condition and can be processed and resold without problems. This will not only save the environment, but also the wallet. We want to provide our customers used brand glasses which are in top condition at a good price. Therefore we clean, polish and disinfect each frame before it goes on sale.